I’m one of those annoying people who think that Inside Llewyn Davis is the best film of 2013. I love the Coen Brothers’ style, they delivered yet again, the film is near perfect, and I left the theatre thinking that I had seen an Oscar winner. Well, the Academy though differently. Not only was Llewyn not nominated for Best Actor or Best Director, but it was also left off the list for Best Picture. Now, I knew that not everyone would love the film the way I did, it’s a unique movie done in a unique way, but I was shocked that the Academy didn’t consider it to be one of the top ten films of the year. That’s no knock on the other films up for Best Picture, they all had their successes with either critics, audiences, or both. But I would put Llewyn in front of any of the others that I’ve seen, including the mighty Wolf of Wall Street. 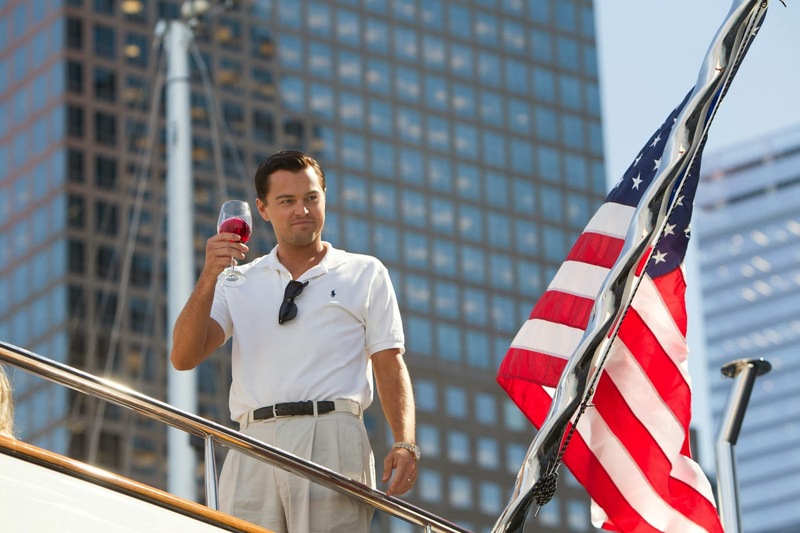 The Wolf in question is Jordan Belfort, a lowly stock broker turned millionaire who lit the financial world on fire in the 1980s. This is a true story based on Belfort’s own book and follows his career, including all its ups and downs. Belfort began as a Wall St. broker and quickly began dabbling in penny stocks, worthless companies whose shares can be sold for high profits. His fledgling company, Stratton Oakmont, became a booming empire almost overnight, and the money started rolling in. But with the fortune came the problems; drugs, crime, money laundering, coverups. And while fighting off the FBI, Belfort was also fighting his own addictions; his dependency on Quaaludes and other drugs as well as his penchant for prostitutes. The high life can’t last forever, and as Belfort’s enemies began to creep closer his empire began to crumble out from under his feet, leaving him with only his friends and his wits to count on. 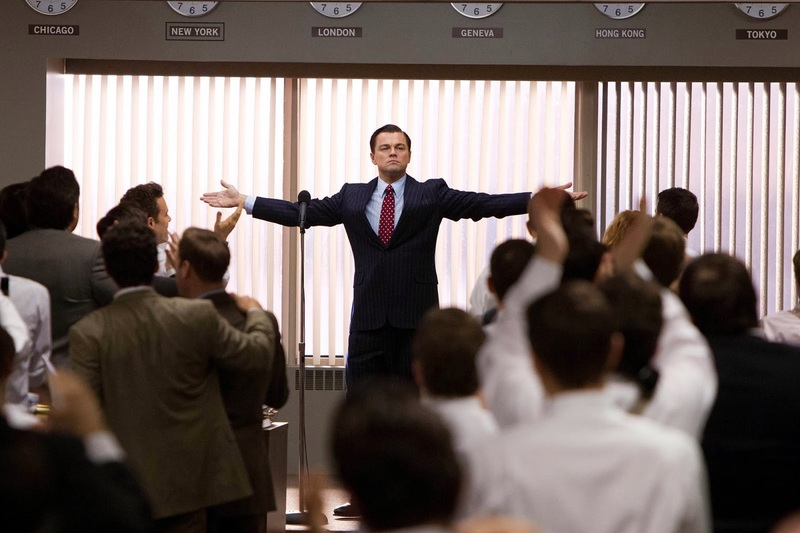 I have literally never seen a film like The Wolf of Wall Street. It was insane. Three hours worth of hard drugs, naked women, mountains of cash, meltdowns, cocaine highs, Quaalude lows, motivational speeches, tidal waves, hookers, midgets, booze, cops, and the ridiculous fashions of the 80s. It was an intense and wild ride though bright colors and spending sprees, made all the more incredible by its mostly being true. What a crazy life to have led, what a tremendous roller coaster to have been on. It stressed me out; I kept having to remind myself that I wasn’t the one doing the drugs, that I wasn’t throwing money off the side of a yacht, that these things were real but were happening to someone else. Seems dramatic, but the story was that in-your-face, that uncontrolled and explosive. But it was also well done, taken from real life to a book to a screenplay to the theatre without losing any of its energy along the way. And the credit there goes to Scorsese, who directed another solid film following the rise and fall of power. It had a major Departed feel, and I’m sure some of that had to do with Leo being in both films. 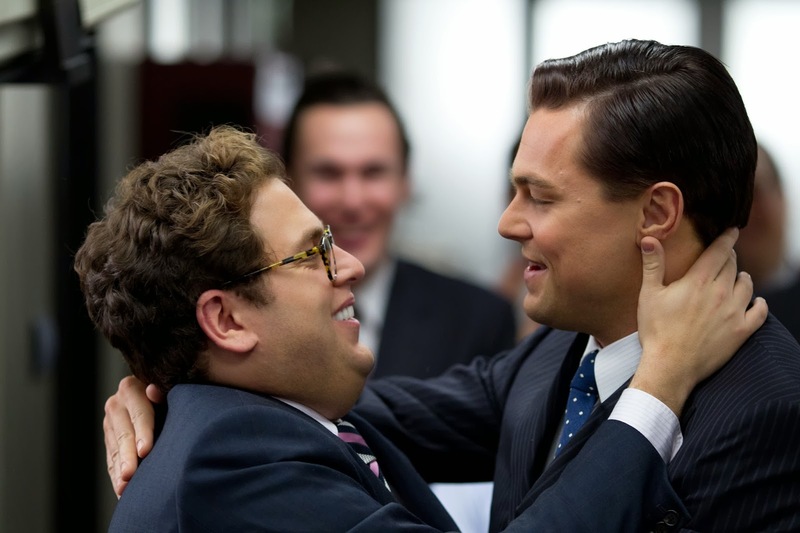 DiCaprio was excellent; insane and yet human, unpredictable yet a true friend. I imagine he’ll win Best Actor for this role, although Matthew McConaughey might give him a run for his money. Incidentally, McConaughey had a nice cameo in this film, as did some others: Jean Dujardin, Jon Favreau, Rob Reiner. And they all were excellent, as were all the side characters, including Jonah Hill, who was far better in this roll than in Moneyball, though I think he’ll get beat out for the Oscar by Jared Leto. The film as a whole was very good, but it wasn’t amazing. The acting was strong, the plot was cool, but man was it long & crazy. It could have been more concise, slightly less manic, bottled up just a little bit. The beginning was tremendous, hilarious, excellent. And then it fizzled bit by bit until by the end I was ready for it to be over. It wasn’t better than Llewyn, not even close. It wasn’t even better than 12 Years or American Hustle. It was more on par with Captain Phillips or Dallas Buyers Club; a film that was well-made but not mind-blowing. Did I enjoy it? Yes. Love it? No. But it’s worth seeing and fun to watch and you should probably check it out.